When medieval knights wanted to insult someone, they threw down a gauntlet, challenging him to a duel; in Shakespeare’s England, a man might bite his thumb at someone to insult him. We southerners prefer a more devious method: the “bless your heart—.” This stereotypical southern slogan is meant to absolve us from rudeness and accusations of improper conduct by neutralizing the insult that follows. After all, we blessed your heart! How could that possibly be rude? At the recent Learning Forum for Classical Conversations leadership, during a breakout session about assessment*, I discovered a subtler application of the “bless your heart” effect. This one is embedded in our grammar. Have you ever received feedback that way? If you are like me, you may be tempted to fast-forward through the praise, seeking the “but” that will reveal an underlying failure. When it comes, the “but” takes precedence over everything positive. Subconsciously, we have decided that either success or failure—usually failure—will be the bottom line. In contrast, the breakout speaker, Amanda Butler, encouraged us to make a simple but powerful change: use the conjunction “and” instead of “but.” That way, both praise and constructive criticism stand on equal footing. For example, “I thought she did a good job making eye contact, and she could work on her posture.” The implied lesson is that areas of growth build on existing successes rather than replacing them. The goal is a whole speaker, a whole writer, a whole student, and a whole person. Notice also that this method leaves room for future improvement: “I worked really hard on my memorization, and I got nervous when I started speaking, so I forgot the second line. Next time, I’ll practice in front of others so that I can improve.” Using “and,” we have the opportunity to model an expectation that growth is possible. Being nervous does not negate the hard work, it reveals the next step in the student’s journey. Implementing this change successfully is not simply about word choice; at its core, this change requires an attitude shift. We must decide that both successes and failures are a necessary part of learning. Both are worthy of celebration and recognition. If we can make that decision and implement that change, we will be better equipped to—truly—bless the hearts and minds of those we assess. **Amanda Butler wants to thank Anita Wilson for sharing this idea in class one day many years ago. Jen Greenholt was an early participant in the Classical Conversations Challenge programs, which sparked her passion for the plays of Shakespeare. She went on to receive a B.A. in English from Bridgewater College of Virginia and an M.A. from Wake Forest University, specializing in early modern British literature. 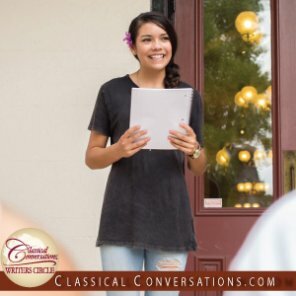 Jen has been working for Classical Conversations as a writer and editor since 2005, and became Vice President of Classical Conversations MultiMedia in 2017. She is the author of the Words Aptly Spoken literature study guides and a co-author of the Classical Acts and Facts Science and History Cards. When she is not glued to a computer, Jen can be found dancing, leading wine tastings at a local vineyard, or playing Ultimate Frisbee.